Get an in-depth look at an important facet of American history on this Benjamin Franklin walking tour of Philadelphia. Known by most for the famous kite-flying incident, Franklin was in fact a notable 18th-century scientist, businessman and politician who contributed greatly to society. Following your knowledgeable guide, learn about Franklin’s life and role in the Revolutionary War and Continental Congress as you visit sites like Franklin Court, Christ Church, the American Philosophical Society and the post office, where he served as postmaster general. This small-group tour is limited to six people, ensuring a more personalized experience. 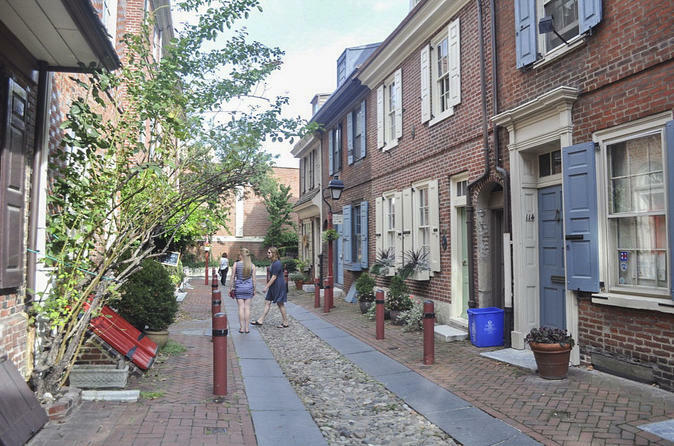 Your walking tour starts at Elfreth's Alley, where you’ll begin to explore Philadelphia through the lens of Benjamin Franklin, one of America’s most notable scientists, businessmen, politicians and philosophers. Your expert historian guide will entertain you with enlightening commentary. Get an in-depth look at Franklin's life, his important role in society and his impact on American history, as well as the social and political changes that took place in this city during the 18th century. You'll also hear about his famous kite-flying incident, where he proved that lightning is electricity. Visit sites central to Franklin’s life such as the post office, where he served as postmaster general. Stop by Franklin Court, Christ Church and the American Philosophical Society, and hear about his fascinating work as an inventor beyond the famous kite-flying story. You’ll also discuss his role in the Revolutionary War, international diplomacy and the Continental Congress. © 2019 Hello Philadelphia - All Rights Reserved.